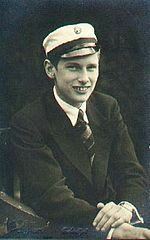 Prince Gorm of Denmark (Danish: Prins Gorm Christian Frederik Hans Harald til Danemark til Ísland; b. Jægersborghus, 24 February 1919 – Copenhagen, 26 December 1991) was the first son of Prince Harald of Denmark and his wife, Princess Helena Adelaide of Schleswig-Holstein-Sonderburg-Glücksburg. He was an Officer of the Royal Danish Navy. He died unmarried and without issue.